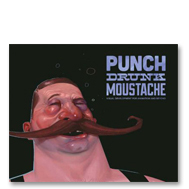 Punch Drunk Moustache is the off-the-clock work of eight animation industry artists with the insatiable need to tell stories. Each artist showcases new ideas infused with unique personal style. Get ready for stunning visual development and never before seen concepts. Giants, androids, strange beasts, brave animals, magic, mystery, and everyday folks collide in these vividly imagined tales. With Punch Drunk Moustache, the gloves are off! Categories: Books, sorry you missed us // out of print. Tags: amy christenson, chris voy, jeff sangalli, john-paul balmet, max lim, nate watson, sean pando, will nichols. 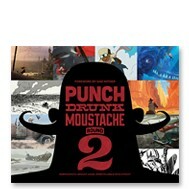 From animated series Star Wars: The Clone Wars and Batman to video games The Walking Dead and Game of Thrones, the 10 concept designers of Punch Drunk Moustache 2 have thrilled audiences worldwide with their work on some of the most popular animated films, TV shows and video games produced today. Prepare to be knocked out by more imaginative worlds and characters created by artists John-Paul Balmet, Molly Denmark, Andre Kirk, Dela Longfish, Jim Moore, Will Nichols, Carlos Sanchez, Jeff Sangalli, Amy Beth Christenson Smith, and Chris Voy, whose original art and stories will take you to fascinating imaginary lands.